Linnaeus was born on May 23, 1707, into a religious family in South Rashult, Sweden. His father’s passion for gardening and natural history instilled in Linnaeus an enthusiasm for botany, which remained the primary focus of his life’s work At university; Linnaeus studied medicine, a discipline that included botanical training, and, by 1734, he had identified more than 100 new plant species. By 1730, he became dissatisfied with the prevailing system of classifying plants by seed comparisons and began to develop a new method based on the number and arrangement of flowering plants’ sexual organs (pistils and stamens). This idea emerged from his belief, unlike that of many of his contemporaries, that plants reproduce sexually. In 1735, Linnaeus traveled to Holland where he published his first book, Systema Naturae, in which he presented his new botanical classification system. In 1738 Linnaeus received a medical degree from the University of Harderwijk, Holland, and returned to Sweden to practice medicine. He joined the University of Uppsala in 1741 as a professor of medicine and was soon appointed head of the botany department. Linnaeus collected and classified a vast number of plants during his life, procedures that required extensive notes. Plant species were designated by their genus name plus a lengthy description of their appearance. Linnaeus began to record a shortened designation, which included the organisms genus name and a single species name to replace the lengthy version. Linnaeus outlined this binomial classification system in Philosophia Botanica, published in 1751, and applied it to the classification of 8,000 plant species in Species Plantarum, published two years later. Linnaeus continued to teach botany and classify plants until his death on January 10, 1778, in Uppsala, Sweden. Because of Linnaeus’s innovations, the cataloguing of living things progressed greatly during his lifetime. As an enthusiastic teacher, Linnaeus elevated the perceived importance of taxonomy within the field of biology and inspired students to travel widely in search of unknown plants. 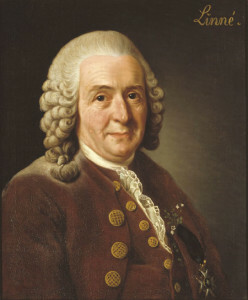 In the eighteenth century, previously unknown organisms were identified at an increasing rate all over the planet, and Linnaeus’s classification method allowed a systematic recording of those discoveries. The Linnaean Society was established in 1788, a testimony to the immediate significance of his work. Linnaeus’s binomial nomenclature created an international language for biological studies. Humans have long had names for different kinds of organisms, but popular names vary with language and location, hindering accurate cross ­cultural communication. Scientists began to contemplate the production of biology books in the late fifteenth century, after the invention of moveable ­type printing. To write books with universal scientific appeal, they needed a universal biological language, and so they developed the multiple­ word naming system that preceded that of Linnaeus. Linnaeus’s binomial system dismissed the problems associated with such an inconvenient system, gave structure to the task of naming organisms, and simplified biological discourse. Binomial nomenclature was accepted as an international standard during Linnaeus’s lifetime, and scientists still use it to name organisms today. The theory of evolution has altered some of the classifications mapped by Linnaeus and his successors. Linnaeus believed that his classification system was simply a recognition of a natural arrangement of immutable species created by God. However, evolutionary theory posits that species evolve over time. Taxonomists now use genetics and biochemistry to investigate evolutionary history, to distinguish species, and to determine taxonomic relationships. Posted on March 8, 2015 by Natalie. This entry was posted in Botanists. Bookmark the permalink.